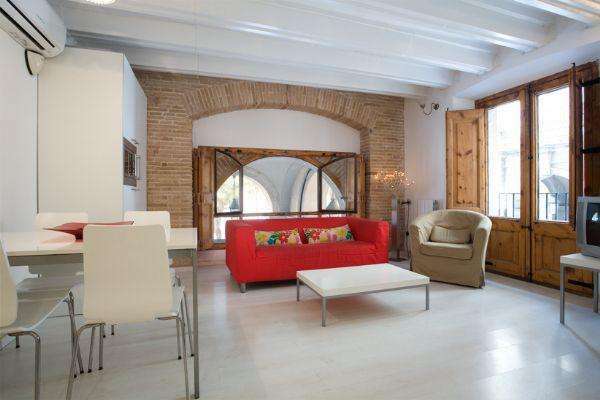 Situated in Barcelona´s ´Old Port´, also known as Port Vell, this lovely one-bedroom apartment in Barcelona, has easy access to the city center as well as the beach! The apartment can accommodate up to four people in total. The apartment enjoys a mix of traditional and modern elements, with the exposed ceiling beams, open-faced brick walls and French windows adding to the Spanish feel of this charming locale. The apartment has an open-floor design, with the living room, dining room and kitchen all sharing a space. The living room is furnished with comfortable sofas and a TV with Satellite, making it the perfect place to unwind after a long day. An Internet connection is also available, making it easy to stay connected. The fully equipped kitchen has plenty of the utensils and appliances needed to create your very own home-cooked meal. Even though the apartment only has one bedroom, a double bed and two single beds can be found, ensuring a comfortable stay for up to four people. The apartment has one bathroom, fitted with a walk-in shower. This lovely apartment, complete with air-conditioning and located in an area that ensures easy access to all that Barcelona has to offer, is an ideal living space at any time of the year! Catalan for "Old Port," Port Vell is located next to the Barceloneta neighborhood. It has been recently renovated, and now offers a vast range of leisure and cultural activities and services, some of which are built on an artificial island. There is a large shopping mall, Maremagnum, located right at the heart of the port, which includes a variety of restaurants ranging from fresh seafood to quick snacks. Here, you will also find the Barcelona Aquarium and IMAX theater. Other nearby attractions include the Museum de Història de Catalunya, the World Trade Center, the Rambla de Mar, and the Barcelona Royal Maritime Club. This is a wonderful area for visitors of all ages to enjoy and choosing an apartment in Port Vell will give you the opportunity to experience the history, culture and new developments of this fascinating city on the Mediterranean coast.